When you tell a story, you tell it through your own lenses, and it will be coloured by your own experiencing. 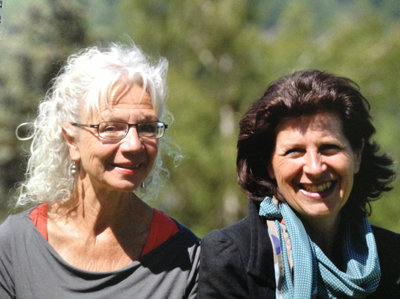 We tell the story of Focusing in Switzerland through the eyes of the 2nd (Christiane Geiser) and 3rd (Eveline Moor) generations. Switzerland has a long history of Focusing: Gene Gendlin came to Zurich to do a presentation as early as 1975. He was invited by Agnes Wild-Missong, who had a shared practice with Urs Wittmer. Soon these two started to give the first Focusing workshops in Switzerland. Agnes translated the little “Focusing” book into German; it appeared in 1983. Cooperation with the German speaking countries then began, and Gene chose the first generation of coordinators: Agnes Wild Missong from Switzerland, Johannes Wiltschko from Austria and Friedhelm Köhne from Germany. In the German-speaking countries, as in Switzerland, Focusing by and by was integrated into person-centred workshops or taught on its own. 1980 Ernst Juchli and Johannes Wiltschko (later joined by Christiane Geiser) started to design a training for therapists and counsellors, in which Focusing was deeply “crossed” with the personcentred approach and person-centred bodypsychotherapy (www.gfk-institut.ch). At the same time a Focusing Network began to offer annual training courses. Important new strands enriched Focusing: bodywork, a cyclic way of thinking and model development, working with structure-bound processes, the social and political relevance of Focusing. Teresa Dawson invited Gene in the 90ies 3 times to Zurich. She became a Coordinator, ran TAE courses in German together with Gene and translated the videos. Eveline Moor is a professional adult educator, and as a Coordinator, she has created the Focusing Centre Casa Civetta (www.focusingausbildung.ch) to teach all levels of Focusing and to build a community. 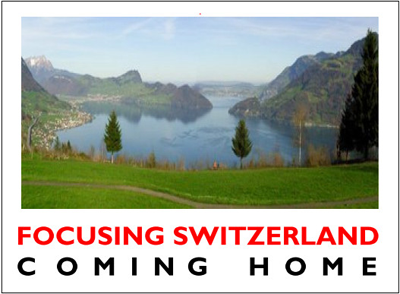 For more than 30 years, there was no “overall association” for Focusing in Switzerland. Today there are different institutes, little schools, and private persons teaching Focusing and TAE, translating relevant texts, training trainers and developing methods for applied Focusing e.g. in psychotherapy, health professions, social work, music therapy and art. 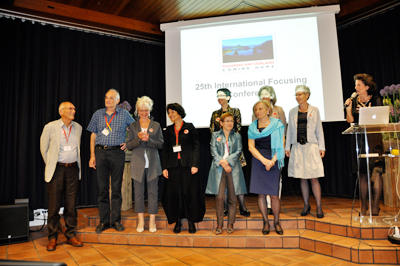 By organizing the 25th International Focusing Conference 2 months ago, Swiss Professionals from different institutes came together for the first time to build a large committee. They got to know each other at the conference and are now creating new ways of connecting: www.focusingswitzerland.ch and www.focusing.ch will be the “home”pages for finding a trainer, formation, development and for research into Focusing in Switzerland. organizing team to welcome 220 people from 28 countries in May 2013 to our homeland. In a one-year process in 2011 we found our theme: Coming Home! We found it by looking at the „Heidi“ in us – what does it mean to us to be born and live in Switzerland. All these processes built the foundation of the conference, which had a huge impact on all participants – as we were later told. Many people said to me how wonderful it was: My dream had come true for me, but also for them.